Two minutes is a lifetime in football, just as it is in many other sports. With two minutes remaining on the clock, Lancaster was knocking on the door at the Lake Ridge 3-yard line. On second and goal, Lancaster quarterback Trevon Hatton was crushed at the line of scrimmage and shoved back to the seven. Lancaster was called for a false start on the next play moving the ball to the 12. Two incomplete passes ended the Lancaster drive, and the game. The game began on a very promising note for the Tigers. Lancaster scored twice in the first quarter, seeming to control the game. Hatton threw an 8-yard to Jayce Medlock for a TD. The score was 6-0 after a two-point conversion failed. The next strike for pay dirt by Lancaster came on a 50-yard pass from Hatton to Malik Rector. Hatton then scampered in for the two on another conversion attempt, bringing the Lancaster lead to 14-0 at the end of the first quarter. Lake Ridge broke the offensive ice in the second quarter on an interception of a Hatton pass by David Wilson for a 17-yard run and a TD. Jacob Meeks was good for the PAT. Lancaster led 14-7. Lake Ridge scored twice more in the half on a pass from quarterback Chandler Rogers to Malik Knowles for 20-yards, and another Rogers pass of 62-yards to Knowles.Both PATs by Meeks were good, and Lake Ridge led 21-14. The last scoring of the game for Lancaster came with minutes left in the half on a Devante Lacy two-yard dive for a TD. The PAT was not good and the half ended 21-20 Lake Ridge. The last scoring of the games was in the third quarter on a 34-yard kick by Meeks, giving Mansfield a lead it would not relinquish. Even though the game was a defensive duel, the offensive stats were massive. Both teams combined for nearly a thousand yards of offense. Devante Lacy for Lancaster was 29-210 yards rushing and Trevor Hatton was 22-105 yards. Lake Ridge was led by Chandler Rogers 14-127 and Cartraven Walker 8-118 yards. Lancaster had a total 170 yards in the air followed by Lake Ridge’s 152 yards. 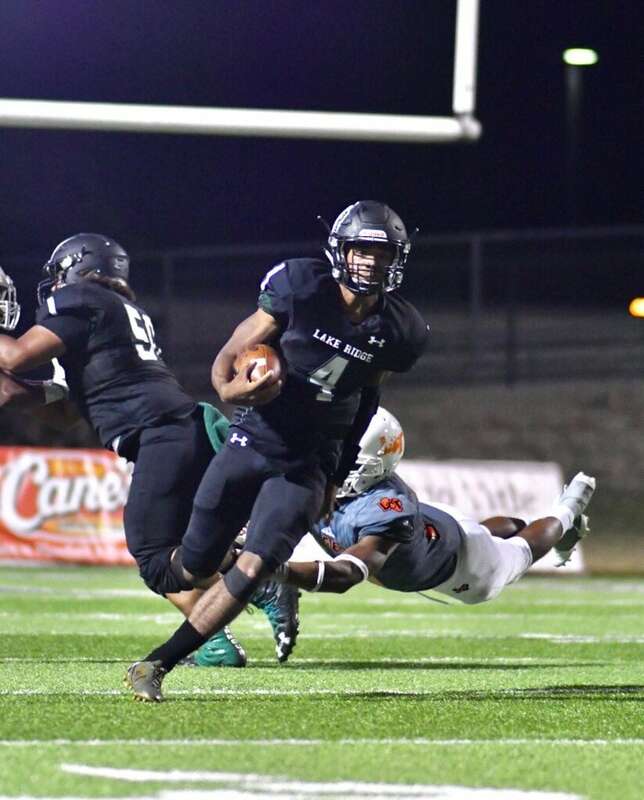 It was obvious the importance of the defense for Lake Ridge as Lancaster’s last five possessions ended in two punts and three turnovers on downs.